What’s New for the 2015 Ford Transit Van? The 2015 Ford Transit Van is all-new and intended to replace the E-Series. Versatility is the name of the game. 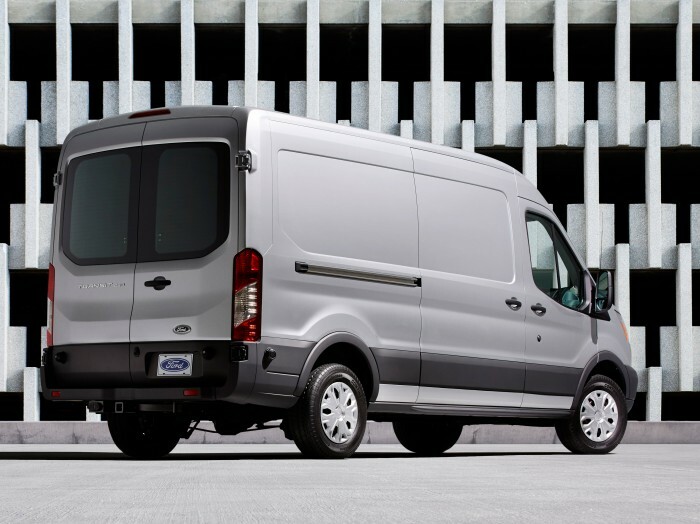 The 2015 Ford Transit Van comes with three roof profiles—83.6 inches, 100.8 inches, and 110.1 inches—and six body lengths ranging from 217.8 inches to 263.9 inches, ensuring that buyers can always get exactly what they need. It boasts a large swept-back windshield, soft corners on the front end, tinted glass, and 16-inch steel wheels with color-keyed hubcaps. The high roof betrays the Transit’s European roots, where compact cities and roads make vertical space more valuable. The 2015 Ford Transit Van offers three engines depending on what you plan to use it for, all paired to a six-speed automatic transmission with SelectShift and a tow/haul mode. The base engine is a 3.7-liter V6 producing 275 horsepower and 260 pound-feet of torque. There’s also a 3.5-liter turbocharged EcoBoost V6 producing 310 hp and 400 lb-ft of torque and a 3.2-liter Power Stroke diesel five-cylinder producing 185 hp and 350 lb-ft of torque. Ford boasts the 2015 Ford Transit Van is 46 percent more fuel efficient than the E-Series with the EcoBoost engine and gets 19 percent more highway mileage with the base engine. The EPA has rated both at 14 mpg in the city and 19 on the highway. The diesel has yet to be rated. Ford offers a long list of standard and available features that make the 2015 Ford Transit Van interior one of the most hospitable around. This includes front air conditioning, power accessories, three 12-volt power points, LED lighting, leather-wrapped steering wheel, a navigation system, and an eight-speaker audio system with SYNC voice control. The 2015 Ford Transit Van comes standard with antilock disc brakes, stability and traction control, post-collision safety system, and tire pressure monitoring system. It also offers lane departure warning technology as well as a rearview camera with trailer hitch assist.